The range of ASUS gadgets with the Zen prefix is ​​not limited to laptops and smartphones. Among them are more exotic devices, such as portable monitors, like the ASUS ZenScreen GO MB16AP, which came to the gg editor . The category itself is relatively new and somewhat specific. Let’s try to figure out who can benefit from such a gadget and how good is the MB16AP test subject. ASUS ZenScreen GO MB16AP is a portable 15.6-inch IPS-monitor with a resolution of 1920×1080, with the ability to connect via Display Port (Type-C) or USB, powered either from a signal source or the built-in battery for 4 hours of battery life. The monitor comes in a large box of black cardboard with a beautiful printing. Inside – the monitor itself, power supply, Type-C cable, adapter from Type-C to Type-A, folding case-stand, stand in the form of a pen (in fact, this is a pen) and documentation. To begin with, it would be nice to figure out for whom portable monitors are intended and what can be done with them. A large number of users at work use two, and sometimes three monitors. Of course, on a trip with a laptop in this case it will be somewhat unusual and for a more comfortable work, you can take a similar portable monitor. Programmers often use an additional monitor in a vertical orientation, so that you can see more code on one page. Plus, lately in some smartphones desktop modes have appeared, or simply duplication of the desktop on a connected monitor. So you can find the use of such a gadget, and it will be extremely useful for a certain audience. Well, now let’s go directly to the hero of the review and its features. What does the design look like and what? 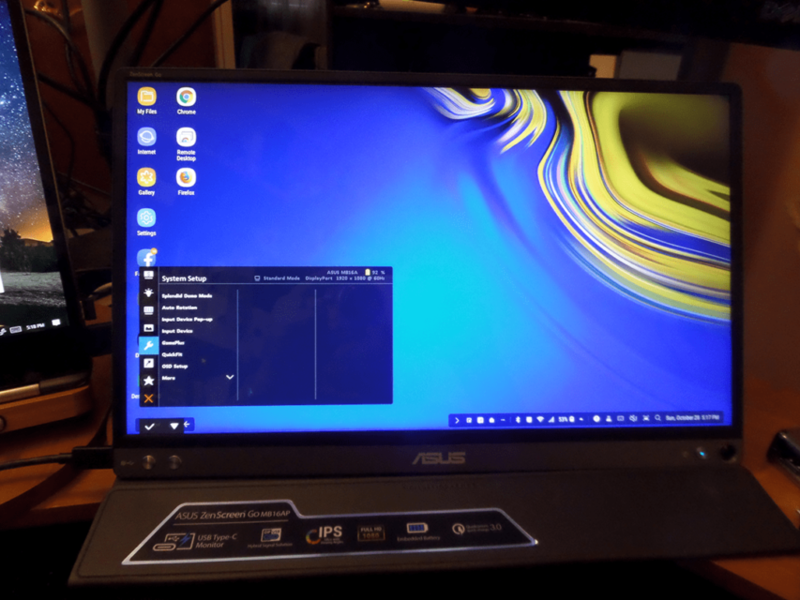 The monitor itself is made in the best traditions of ZenBook laptops: a metal case with brand concentric grinding and the ASUS logo in the middle. The body was small: 359.7×226.4, and the thickness is only 8 mm. The monitor weighs 800 g, so it’s really quite convenient to transport it. The edge of the screen around the perimeter is made of matte black plastic, and at the bottom there is a silver bar with control buttons and the ASUS logo. How good is the picture? The monitor uses an IPS-matrix with a resolution of 1920×1080, promising a rather modest maximum brightness of 220 cd / m2 and a static contrast ratio of 800: 1. The screen is not touch, but the coating is glossy. In order to reduce eye fatigue, ASUS used flicker-free technology and a blue filter with five levels in the monitor. The viewing angles are maximum and the picture is pleasant, but the brightness is sufficient only to operate at a low level of ambient light. At home, it is quite comfortable, but under the bright lamps it will not be enough. There are various display modes, including customizable “Standard”, “Fiction”, “Theatrical” and sRGB. In the latter can not adjust the brightness.